I just love teapots. I love coloring too. I am so happy Stampin' Up! decided to do another teapot. The stamp set is Tea Together(148779) and the framelits are Tea Time (SAB 149697). The framelits are free with a $100 order during Sale-a-bration (SAB) I colored the teapot with Coastal Cabana (147097) and the Aqua Painter (103954). The flowers are colored with Grapefruit Grove (147142) ink. The lace is some retired borders from years past. I hope you like my teapot card and you will place an order with me. Let me know what you think. 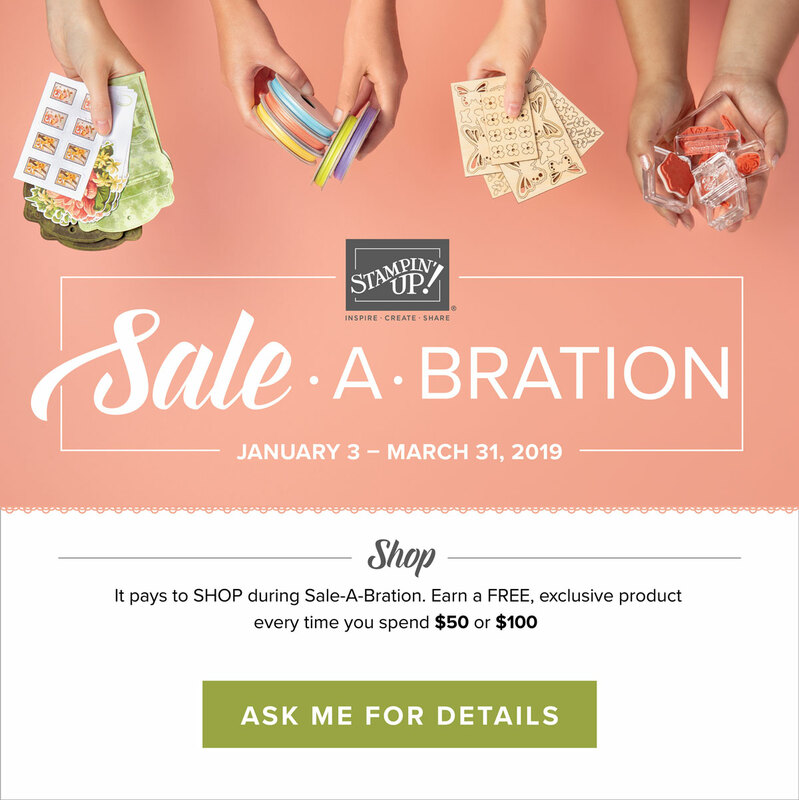 Don't you just love the Grapefruit Grove and Lovely Lipstick foil that is free in the Sale-a-bration catalog. The colors change with the lighting. It's beautiful. All my customers want that foil. It goes with everything. The Lovely Lipstick is gorgeous too. They both are beautiful embossed with our embossing folders. Here I chose the card to be in Grapefruit Grove 8 1/2 X 4 1/4", the foil is 5 1/4 X 4" and the Share What You Love DSP is 2 X 51/4". I cut out Very Vanilla cardstock with the new Rectangle Thinlits . They are stitched on both sides. If you cut a tag like the one used here you get stitching on the tag but you also get stitching on the Very Vanilla around the cut out hole. You can use that for another card. 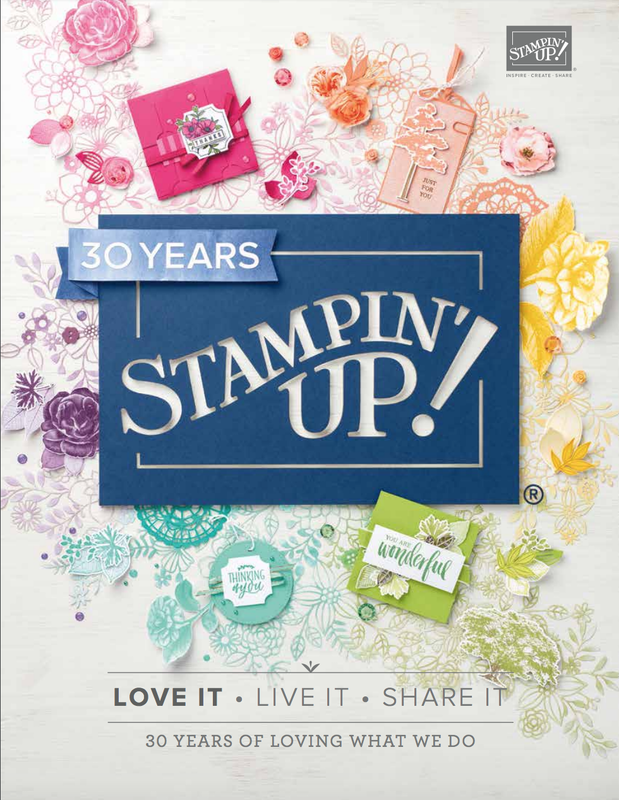 How nice of Stampin' Up! to think of that when designing these thinlits. The organza ribbon is another sale-a-bration item. Have some fun stamping today. Thanks for visiting my blog. Good Morning Stampers, I have made another lovely card that could be used for any occasion. The designer papers in the Occasion catalog are absolutely beautiful as always but this catalog has gone way beyond beautiful. I used the leaves dsp cut to 4 X 5 1/4". This card uses the Whisper White thick cardstock cut at 8 1/2 X 4 1/4" The stamp set is Wonderful Romance (148632) and I used the matching Floral Framelits (148529) to cut the leaves. I stamped the card with Old Olive on a piece of white measuring 2 1/4 X 3 1/2". I am in love with that color. The leaves are stamped on a scrap and cut out with the framelits. I layered the Old Olive 3 X 4' and embossed with the Layered Leaves embossing folder. The Floral romance dsp was used - the vellum Petal Pink is cut to a tag 2 X 5" and punched with the Banner Triple punch. I wrapped linen thread around the card and put a flat gold button for decoration. The small twig is cut with the framelits in Mellow Moss. Sentiment is stamped on a Petal Pink scrap and stamped in black. I hope you like my card. I am trying to do better about posting to this blog. Sometimes life gets in the way. Have a great day. For today's card, I used a beautiful set and fabulous designer paper from the Occasions catalog. It could be a Valentine card or a special day card. The stamp set is Forever Lovely. I used Lovely Lipstick as the card base 8 1/2 X 4 1/4", Whisper White 3 X 4 for the framelit cut and a scrap for the oval sentiment. The Designer paper is All My Love on page 5 of the Occasions Catalog cut to 2 1/2 X 4". The ribbon is Powder Pink ruffled 4 1/2". Pearls were added to each end of the ribbon I attached the ribbon with Tear & Tape.The ink is Lovely Lipstick. I hope you love my card today. This card will be in my class on January 22 in my stamp studio. Sign up for the class. I would love to see you. Have a lovely day. Here is a card I made for an upcoming class. It uses the Lasting Lily sale-a-bration stamp. It is a great set for any occasion. I made the simple card by using an half sheet of Whisper White, scored at 4 1/4 and folded. I took the card and placed the Wonderful Floral framelit on the right side and ran it thru the Big Shop. This framelit makes a beautiful edge on the card. If you use some wax paper between the framelit and the cardstock, it may come out of the framelit better. Remember to take the waxpaper out of the framelit so that the framelit will cut better each time. The lilies are stamped in Grapefruit Grove and Old Olive. The sentiment is in the stamp set and I stamped it in Memento black. I placed a sentiment on the inside from the stamp set. I hope you love the card. Come to class on the 22 of January and make this card in my stamp studio. I can also mail you a kit with a $10 order and the free Lasting Lily stamp set. Whisper White card 1/2 sheet, Botanical Butterflies dsp cut to 3 1/4 X 5 1/2", Botanical Butterflies black polka dot 5 1/2 X1" Black Twine wrapped around the card and tied in a bow.The sentiment is stamped in Memento Black on a scrap ow Whisper White. 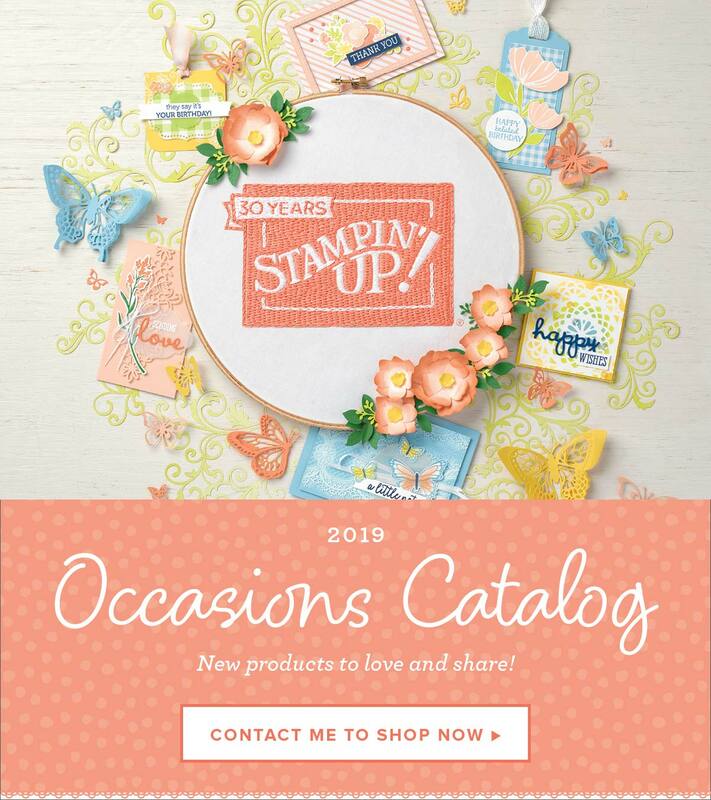 It is in the Humming Along stamp set in the Occasions catalog (pg 36). Now that was very easy and what a beautiful card it is. Have a beautiful day. I hope you are having a creative day. I copied this out of the Stampin' Up! Catalog and Idea Book. It is made with the Love You To Pieces set W(147388) C(147392) and the Puzzle Pieces Thinlits. This is a great set. My online store is http://stamp4martha.stampinup.net . Thanks for stopping by. Thanks for visiting my site today. Here is a card I made using the Blended Seasons Bundle. The colors are Pool Party and Poppy Parade. I used the new Blends to color the card. This bundle is on sale for the month of August only. it will not be in any future catalog. It's a great bundle. I love sending hand made cards. Here is a class I am holding on August 11 at 1 PM in my Stamp Room in Zebulon, NC. There are 5 cards with envelopes to make and the fee is $15.If interested, please sign up ASAP. To sign up just email me at www.stamp4martha@reagan.com. I hope you will come stamp with us. I love anything that has to do with the sea. I will be making this card in my clubs. I used Sea of Textures stamp set and Under the Sea framelits (Bundle 148357W or 148358CM). Cardstock: Tranquil Tide 11 X 4 1/4, Soft Sea Foam 1 X 5 1/2, and another scrap, Crumb Cake 3 X 3, Very Vanilla 1/4 sheet and a scrap of Calypso Coral. Fold card in half and stamp with Fishnet stamp in Tranquil Tide. Layer DSP and strip of Soft Sea Foam to the card. Using the thinlits, cut out the fishnet in Crumb Cake, the Star fish in 2 sizes in Vanilla, sea grasses in Soft Sea Foam and Calypso Coral. Layer per card. Stamp the Octopus in Blackberry Bliss or any color of your choice and cut out with the thinlits. On a scrap of Vanilla, stamp the fishnet in Tranquil Tide and the words of your choice. I cut the cat out using the Stitched Label Thinlits. Tie the twine around the card. Wasn't that easy? Such a great card. I cased this idea somewhere and don't remember where. Have a blessed day.